I woke up this morning…starving, as usual! And I am a ticking time bomb when once I’m up. Anyone and everyone knows that there is about a one hour grace period after my eyes open for me to eat before I start “fee-fi-fo-fumming,” as my boyfriend calls it. When my sugar levels get low, NO ONE is happy. So when I woke up with my belly literally burning in hunger pains, you can imagine how anxious I was to get out of the house for some lunch. I threw my hair back into a ponytail and put on a more acceptable pair of pajama pants to wear in public and headed out with my boyfriend to get some eats. We drove to the Miracle Mile area in Coral Gables, intending to go to the Coral Gables Diner. But I’m from the Northeast, where diner is synonymous with cheap and after glancing at the menu I quickly realized that this was no diner by my standards. They had lunch salads for $17!!! (Prime 112 has entrée salads for less than that!) Although my boyfriend assured me that he didn’t mind the price, it just went against my notion of all that diners stood for and I couldn’t do it. So we walked down the street a little further until we came upon a Vietnamese place. I now had about 30 minutes till “fee-fi-fo-fumm” and so I decided I could eat a Bun, but my boyfriend wanted a more filling lunch and so our walk down the street continued. We stopped to look at all the menus posted outside of the restaurants (on both sides of the street) and finally decided on a Mexican restaurant at the end named Talavera (15 minutes till “fee-fi-fo-fum”). Talavera has the same owner as Jaguar in the grove, but Talavera is Mexican while Jaguar focuses on ceviche. However, there are many similarities on the menu and the atmospheres of the two restaurants resemble one another. To start, they brought out a basket of tortilla chips and 2 different homemade salsas—one tomato sauce and one salsa verde. The waiter told us to be careful because the salsa verde was muy picante, but being the spice lover that I am, I dismissed his warning and without caution and piled that green stuff onto my chip. Well…he should have said muy, muy picante because this sauce packed some serious heat. I found its mouth numbing quality addictive though, and by the time we finished the basket of chips I had probably downed about 3 to 4 glasses of agua. For lunch I ordered the Grilled Chicken Huarache, which I was very apprehensive about since it was my first time having a Huarache dish. 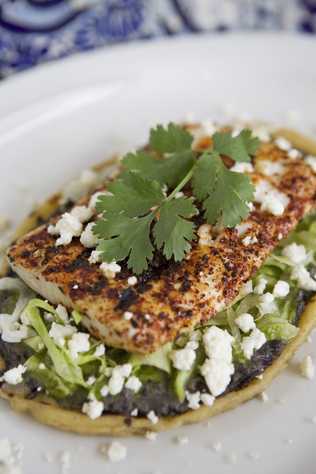 I couldn’t understand how it would be served based on the menu’s description but for those of you who don’t know either, it is a piece of meat (in my case chicken) on top of an oval shaped corn massa with layers of black bean puree, salsa verde, lettuce, and crumbles of goat cheese. The corn massa is not crunchy like a corn chip, but rather firm and about a ¼ thick. This dish was delicious and I ate everything! The flavos of the black beans with the salsa verde and the delicate corn massa—yumm it all worked together perfectly! My boyfriend ordered the Quesadilla La Marquesa, which were large corn tortillas filled wit Oaxaca cheese, chicken, poblano chiles, fresh corn, zucchini and epazote, served with guacamole. Although the flavors were very good, the quesadillas were untraditional and served deep-fried. The shape of the 3 quesadillas resembled Venezuelan empanadas, if you have ever seen one. I thought they were very greasy and did not like them because of that, but my boyfriend loved them. Overall, I thought that Talavera was excellent and agreat value. Both of our dishes were only $12 each, and the portions were not your typical stingy lunch portions. I was so satisfied and would definitely go back again.